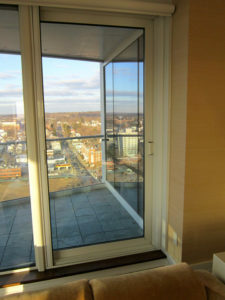 Sliding patio doors often come with a fixed, sliding screen. The problem is that these sliding patio door screens have a tendency to fall off their tracks, be walked through and are generally an eye-sore. Why cover up your view with a screen? The Plisse retractable sliding patio door screen is the perfect solution for screening your sliding patio door. We take pride in our product and the service we offer. 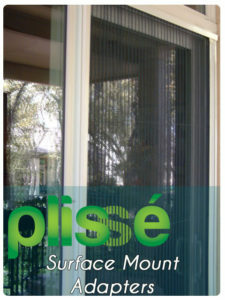 Screen Solutions was the pioneer of the Plisse style retractable door screen in North America. But retractable screens for doors have long been popular in Europe for their practicality. Retractable door screens allow you to use a screen to let the breeze into your home while keeping bugs out. But they also disappear out of sight when not in use so you aren’t looking through your screen when your sliding patio door is closed. Retractable sliding patio door screens slide into a housing when not in use so they are hidden away and protected from the elements. The Plisse retractable screen for your sliding patio door mounts directly to the fixed panel with our optional surface mount adapter. The Plisse style retractable sliding patio door screen is manufactured, custom to your doorway in our Austin, Texas facility where each unit is individually quality tested prior to us shipping it free of cost to your doorstep via ground. Our custom build lead time is currently only 3-5 working days.